Name Variation Frederich Johann Schuette was also known as Johann. Frederich Johann Schuette was born on 14 April 1860 at Germany. Frederich Johann Schuette married Elizabeth Katharine Burmester on 9 October 1884 at Sauk, Wisconsin. Frederich Johann Schuette died on 30 April 1944 at Reedsburg, Sauk, Wisconsin, at age 84. Name Variation Elizabeth Katharine Burmester was also known as Katharine Elizabeth. Married Name 9 October 1884 As of 9 October 1884,her married name was Schuette. Elizabeth Katharine Burmester was born on 24 September 1862. She married Frederich Johann Schuette, son of Johann Wilhelm Christoph Schuette and Catharine Dorothee Klein, on 9 October 1884 at Sauk, Wisconsin. Elizabeth Katharine Burmester died on 20 November 1939 at age 77. She was buried on 23 November 1939 at St John Lutheran Church, Reedsburg, Sauk, Wisconsin. Mary A. Mueller was born in April 1880 at Wisconsin. She was the daughter of Ernest Mueller and Dorothea (?). [S246] U.S. Federal Census 1880 U.S. Federal Census, by Ancestry.com, NA Film Number T9-1446 Page Number 305C. Elijah C. Reed was the son of James Reed. James Giblin was born in November 1834 at Ireland. He was the son of Michael Giblin and Mary Ann Haye. James Giblin married Alice Byrne, daughter of John Byrne and Bridget Royal, before 1861. James Giblin died on 27 July 1927 at age 92. [S247] U.S. Federal Census 1870 U.S. Federal Census, by Ancestry.com, Year: 1870; Census Place: Westford, Richland, Wisconsin; Roll M593_1734; Page: 743B; Image: 390; Family History Library Film: 553233. [S246] U.S. Federal Census 1880 U.S. Federal Census, by Ancestry.com, NA Film Number T9-1446 Page Number 163C. [S245] U.S. Federal Census 1900 U.S. Federal Census, by Ancestry.com, Ancestry 1900 census index has James Giblin surname as "GEBLIR". [S244] U.S. Federal Census 1910 U.S. Federal Census, by Ancestry.com, Year: 1910; Census Place: La Valle, Sauk, Wisconsin; Roll T624_1736; Page: 6A; Enumeration District: 120; Image: 1019. Married Name Her married name was Crawley. Name Variation Anna Giblin was also known as Annie. Anna Giblin married Nicholas Crawley. Anna Giblin was born in 1861 at Ohio. She was the daughter of James Giblin and Alice Byrne. Anna Giblin died in 1949. Robert Giblin was born in 1866 at Wisconsin. He was the son of James Giblin and Alice Byrne. As of 1910, Robert Giblin was never married. He died on 23 June 1922. Mary Giblin was born in August 1868 at Wisconsin. As of 1910, Mary Giblin was never married. She died on 8 February 1966 at age 97. James Giblin was born in 1871 at Wisconsin. James Giblin died on 11 March 1944. Alice Giblin was born in May 1873 at Wisconsin also reported as May 1874. As of 1910, Alice Giblin was never married. She died on 28 February 1966 at age 92. George W. Giblin was born in April 1876 at Wisconsin. Michael Giblin married Mary Ann Haye. 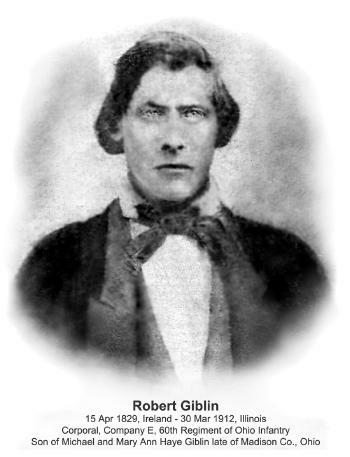 Robert Giblin was born on 15 April 1829 at Ireland. Robert Giblin died on 30 March 1912 at age 82. Nicholas Crawley married Anna Giblin, daughter of James Giblin and Alice Byrne. Nicholas Crawley was born in 1859. George Mehan was born in November 1833 at Meath, Ireland. He was the son of Patrick Mehan and Elizabeth Hughes. George Mehan married Mary Byrne, daughter of John Byrne and Bridget Royal, in September 1861. In 1906 GEORGE MEHAN is one of the well known pioneer citizens of the county and is the owner of a well improved farm in the town of Henrietta. He was born in County Meath, Ireland, in November, 1833, and is a son of Patrick and Elizabeth (Hughes) Mehan, the former of whom passed his entire life in Ireland. In 1845 his widow came with her children to America, making the long and wearisome voyage on a sailing vessel and landing in New York city. In 1846 they came westward and located in Lake county, Ill., where they remained three years, at the expiration of which they came to Richland county, Wis., settling in section 23, town of Henrietta, where they secured a tract of government land, the same being densely timbered. They made due preparation for comfort according to the pioneer standard, erecting a log house and then beginning to clear the land; the house is still standing and is in a fair state of preservation, being one of the landmarks of the early days. The devoted mother continued to reside on this homestead until her death, which occurred in 1875. She became the mother of six children, one of whom died young, in Ireland. Five accompanied her to America, namely: John, who died in the state of Washington, having been a farmer by vocation; Eliza and Patrick are likewise deceased; James died in the state of Washington; and George is the subject of this sketch. The last mentioned attended the parochial schools in his native land, having been thirteen years of age at the time of the family immigration to the United States and thereafter having slight opportunity to attend school, as he was reared in the midst of the forests of Richland county and worked assidiously from his boyhood days. He initiated his independent career when nineteen years of age, doing much clearing of land for others. In February, 1864, he showed his loyalty to the land of his adoption, by enlisting in defense of the Union, becoming a private in Company A, Fifty-second Wisconsin volunteer infantry. He went with his command to Benton Barracks, St. Louis, Mo., later being in service at Kansas City, Fort Leavenworth and in Arkansas, taking part in several spirited skirmishes and doing much scouting. He served until the close of the war, receiving his honorable discharge in August, 1865. About 1862 Mr. Mehan bought forty acres of wild land in section 23, town of Henrietta, and he improved the place and continued to reside on the same until 1891, when he removed to his present homestead, which comprises 160 acres, of which about eighty acres are under cultivation. He has been successful as a farmer and has ever retained the confidence and good will of the people of his community. He is a Republican in his political proclivities and both he and his wife are communicants of the Catholic church. In September, 1861, Mr. Mehan was united in marriage to Miss Mary Byrne, who was born in County Cavan, Ireland, a daughter of John and Bridget (Royle) Byrne, who came to America in 1843, when Mrs. Mehan was twelve years of age. Her father had been a farmer and stock shipper in Ireland. The sailing vessel on which the family took passage was the "Lord Saunders," and the same was partially wrecked en route, nine weeks having been passed on the ocean. They landed in New Orleans and a year later removed to Fairfield county, O., where they remained until 1859, when they came to Richland county, Wis., settling in Westford township, where Mr. Byrne reclaimed a good farm, and there passed the remainder of his life. His widow died in Sauk county. Of their eight children Mrs. Mehan is the eldest; Alice is the wife of James Giblin, of Sauk county; Bridget is the wife of Daniel O'Hara, of Spaulding, Neb; Francis is a farmer in Sauk county, Wis; Ann is the wife of Frank Byrne, and they reside in Kansas; Ellen lives at Ironton, Sauk county; Catherine died in Ohio; and Philemon died before the immigration to America. To Mr. and Mrs. Mehan have been born six children: Elizabeth Ann is the wife of John Slaney, mentioned in this publication; Mary Alice and Bridget are deceased; John is a traveling salesman and resides in Baraboo, Wis; and George and Jane remain at the parental home. Patrick Mehan married Elizabeth Hughes. Patrick Mehan died before 1845 at Ireland. Married Name Her married name was Mehan. Elizabeth Hughes married Patrick Mehan. Elizabeth Hughes died in 1875. Elizabeth Hughes immigrated in 1845. John Mehan was the son of Patrick Mehan and Elizabeth Hughes. John Mehan died before 1906 at Washington. James Mehan was the son of Patrick Mehan and Elizabeth Hughes. James Mehan died before 1906 at Washington. Patrick Mehan was the son of Patrick Mehan and Elizabeth Hughes. Patrick Mehan died before 1906. Eliza Mehan was the daughter of Patrick Mehan and Elizabeth Hughes. Eliza Mehan died before 1906. Name Variation Francis S. Byrne was also known as F. S.
Name Variation Francis S. Byrne was also known as Frank. Francis S. Byrne was born circa 1823 at Ireland. He married Ann E. Byrne, daughter of John Byrne and Bridget Royal, circa 1862. Francis S. Byrne died before 1900. 1 March 1885 Cottonwood, Chase, Kansas He appeared on the census of 1 March 1885 at Cottonwood, Chase, Kansas. [S246] U.S. Federal Census 1880 U.S. Federal Census, by Ancestry.com, NA Film Number T9-0375 Page Number 266A. Philemon Byrne was the son of John Byrne and Bridget Royal. Philemon Byrne died before 1852 at died before the immigration to America. Married Name 14 April 1891 As of 14 April 1891,her married name was Slaney. Elizabeth Ann Mehan was the daughter of George Mehan and Mary Byrne. Elizabeth Ann Mehan married John Slaney, son of John Slaney and Bridget Mulcahy, on 14 April 1891. John Slaney was born on 15 December 1856 at Wisconsin. He was the son of John Slaney and Bridget Mulcahy. John Slaney married Elizabeth Ann Mehan, daughter of George Mehan and Mary Byrne, on 14 April 1891. JOHN SLANEY is a native of the town of Henrietta, this county, and is now one of its representative farmers and stock-growers, also being a member of one of the well known pioneer families of the county. He was born on the homestead farm, Dec.15, 1856, and is a son of John and Bridget (Mulcahy) Slaney, who were born and reared in County Cork, Ireland, where their marriage was solemnized, and where the father followed agricultural pursuits. In 1851 he immigrated with his family to America, making the voyage on a sailing vessel, which was seven weeks in completing the trip. They landed in New York city, and thence removed to Mercer county, Penn., where he entered the employ of the Pennsylvania Railroad Company. In 1855 he removed with his family to Richland county, Wis., where he secured forty acres of government land, in section 23, town of Henrietta, the tract being covered with heavy timber. He put up a log house and stable on the place and began the work of reclaiming his land, but he lived only five years after coming to the county, having been killed in February, 1860, while assisting in a chopping-bee at the farm of a neighbor. His wife long survived him and resided with her children until her death, which occurred Apr. 14, 1901. Both were devout communicants of the Catholic church and in politics he voted the Democratic ticket. They had seven children: Thomas was murdered, near Dallas, Tex., many years ago; Morris resides in Milwaukee and had been an engineer on the Chicago, Milwaukee & St. Paul Railroad for the past quarter of a century; the subject of this sketch was the next in order of birth; Catherine died in childhood, in Pennsylvania; Andrew J. is an engineer on the Chicago, Milwaukee & St. Paul Railroad and resides in the city of Milwaukee; Mary is a Sister of St. Shepherd, Milwaukee; and Patrick is a farmer of Henrietta township. John Slaney, to whom this review is dedicated, received limited educational advantages in his youth and he aided in reclaiming the home farm, where he was reared to maturity. As a young man he was employed for varying intervals in Minnesota, Iowa and Illinois, and he was fireman on the Chicago, Milwaukee & St. Paul Railroad for nearly three years. In 1891 he was married and shortly afterward he located on his present fine homestead farm, having purchased forty acres of the same - the McCarthy farm - five years previously and having since added to the same until he has a total of 249 acres, in sections 22 and 23. He has cleared and placed under cultivation about 100 acres. In 1889 he erected his substantial and commodious brick house and in 1899 he built his large and substantial barn, also having erected other requisite buildings for the care of stock and produce. He makes a specialty of the stock-growing department of his farm enterprise, raising a large number of Shropshire sheep, and Poland-China swine, besides cattle and horses. He served as clerk of his school district, No. 4, for eighteen years, was school supervisor two years, and was chairman of the town board four years. He gives his support to the Democratic party, and both he and his wife are prominent members and communicants of St. Patrick's Catholic church, being active in parish work; he served several years as treasurer of the church. Apr. 14, 1891, was solemnized the marriage of Mr. Slaney to Miss Elizabeth A. Mehan, who was born and reared in the town of Henrietta, being a daughter of George Mehan, of whom individual mention is made on another page of this work. To Mr. and Mrs. Slaney have been born eight children, whose names, with respective dates of birth, are as follows: Andrew, Aug. 9, 1892; Mary E. and unnamed infant, twins, Dec. 23, 1893, the latter dying soon after birth; Bridget, born in June, 1896, died in the same year; Elizabeth, Apr. 21, 1897; Catherine, June 16, 1898; John George, Mar. 23, 1901; and Clara Agnes, Nov. 3, 1903. Mary Alice Mehan was the daughter of George Mehan and Mary Byrne. Mary Alice Mehan died before 1906. Bridget Mehan was the daughter of George Mehan and Mary Byrne. Bridget Mehan died before 1906. John Mehan was the son of George Mehan and Mary Byrne. George Mehan was the son of George Mehan and Mary Byrne. Jane Mehan was the daughter of George Mehan and Mary Byrne.